Week 36 already and we only have 16 weeks left. How time flies! I can still remember the first week with this challenge in which I only shelled out as little as 50. Since then, it has been a constant challenge to remind myself every single week to pour in the necessary amount. There were times when I don’t have much hence I just made some “utang” with the challenge. This holds true when I incorporated the Pay It Forward Mechanism. Alas, I am excited to report the development of my challenge so far. 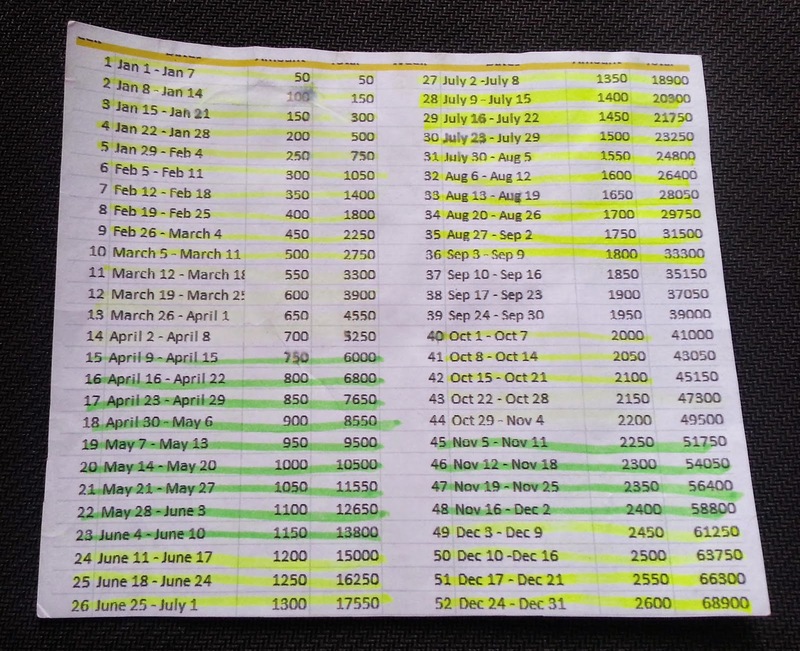 Basically with the Pay It Forward Mechanism, I already covered the months of October, November and December. Hurray! Well it was not easy. The first weeks were literally a walk in the park however as the values were getting bigger I have to shove away some comfort of mine in order to cater to the amount. Yet in the process, I was able to quantify a portion of my salary immediately to the challenge. I always see to it to deposit the necessary amount from my ATM in order to block off the weeks. You see, I deposited the money in a local bank here so I can secure it, no ATMs and it would take a lot of work to go there. Can’t wait to finally complete the challenge! I am almost there. For those who did the challenge in the beginning of the year, I hope you still have the motivation and the enthusiasm to continue. Push yourself to finish it regardless of the amount. Few more months left and we are done! I will also share where the entire amount will go once I completed it. Remember, keep the 'saving' spirit. It will be YOU who will benefit most from the challenge. Continue saving! P.S. To those doing the 52 Week Money Challenge and 52 Week Money Challenge Version 2, it is Week 36 already! Did you deposit the next amount yet?